KRUSENSTERN -Map of Port Anna Maria (Taiohae Bay) at Nukuhiva, Marquesas Islands. KRUSENSTERN, A.I. /TILESIUS, W. - Map of Port Anna Maria (Taiohae Bay) at Nukuhiva, Marquesas Islands. Map of Port Anna Maria (Taiohae Bay) at Nukuhiva, Marquesas Islands. - KRUSENSTERN, A.I. /TILESIUS, W.
Title : Map of Port Anna Maria (Taiohae Bay) at Nukuhiva, Marquesas Islands.. Description :An original map in imperial folio size with wide margins, originating from Krusenstern's 1813-14 atlas (Russian & German language) to his voyage around the world: Atlas k puteshestviuu vokrug sveta kapitana Kruzenshtema. The map has a small round cartouche, reading: "Plan des Hafens Anna Maria auf der Insel Nukuhiwa". Krusenstern's illustrations of his short stay at NukuHiva, Marquesas Islands have become archetypal images in the history of Pacific exploration. His two ships anchored at Port Anna Maria (Taiohae Bay), arriving on May 6 and may 11, 1803. They left again on May 18 that same year. 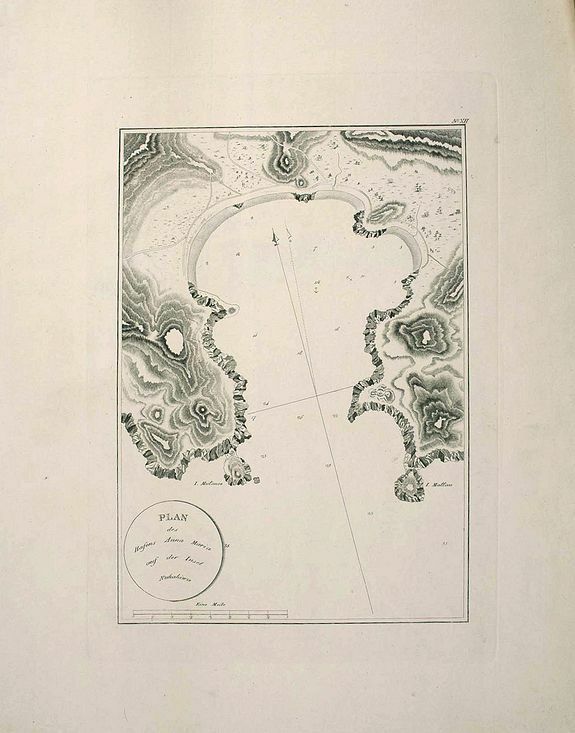 This map may well be the first printed map of Taiohae Bay. Condition : Very good condition, printed on thick paper, left & right margin a little chipped.